Tengnoupal battalion of 26 Sector Assam Rifles on Friday recovered 9,800 World is Yours (WY) tablets worth Rs 49 lakhs from a Jungle track near Khudengthabi, Tengnoupal district in Manipur. Assam Rifles sources told Northeast Now that ambush party spotted an individual Ngamjatong Mate (52) son of Ngulkho Mate, resident of village Tuipi Lokchao, Tengnoupal district moving suspiciously with a bag. On checking the individual, 9,800 WY tablets were recovered. Estimated value of the contraband drug is Rs 49 lakh. The apprehended person along with recovered drugs was handed over to Moreh Police Station. “On June 22, 2018, based on specific information regarding peddling of contraband drugs using a jungle track in Khudengthabi an ambush was laid to apprehend the peddler,” PRO Assam Rifles said. 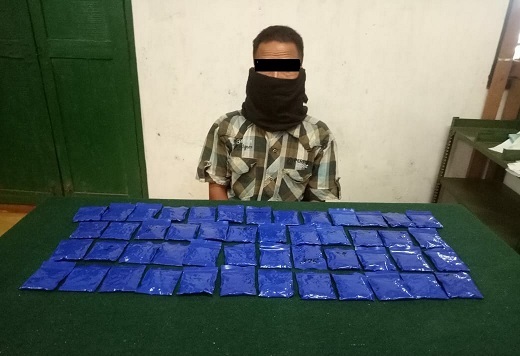 On June 21, Tengnoupal battalion of 26 Sector Assam Rifles seized 7.740 kgs of WY tablets and 690 grams of Brown Sugar worth Rs 7 crore from a Jungle track near Khudengthabi in Manipur’s Tengnoupal district.